At Best Home & Property Services, our basement flooring options are all made specifically for concrete basement floors. When installed in your home, our flooring options will never rot, decay or support mold growth. All of our flooring products are designed to easily interlock for quick installation without grout or adhesives. The interlocking flooring is ideal for basements since the flooring can be picked up and reinstalled if water gets underneath. Combined with our other basement products, and our basement waterproofing system, it's a great way to upgrade your home! With a one-day installation, you can add beauty, comfort, and value to your home with our finished basement flooring. For a free basement floor quote, call or e-mail us today! 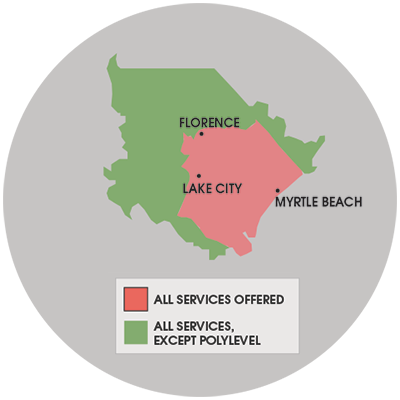 We proudly service South and North Carolina, including Marion, Dillon, Murrells Inlet, Manning, Cheraw, Loris, Kingstree and nearby areas. At Best Home & Property Services, we're proud to provide five different basement flooring options with a variety of color and texture choices.